My Schlumbergeras are now blooming for the second time since I brought them inside. I wondered, it is the daylength that has encouraged them to start blooming again? 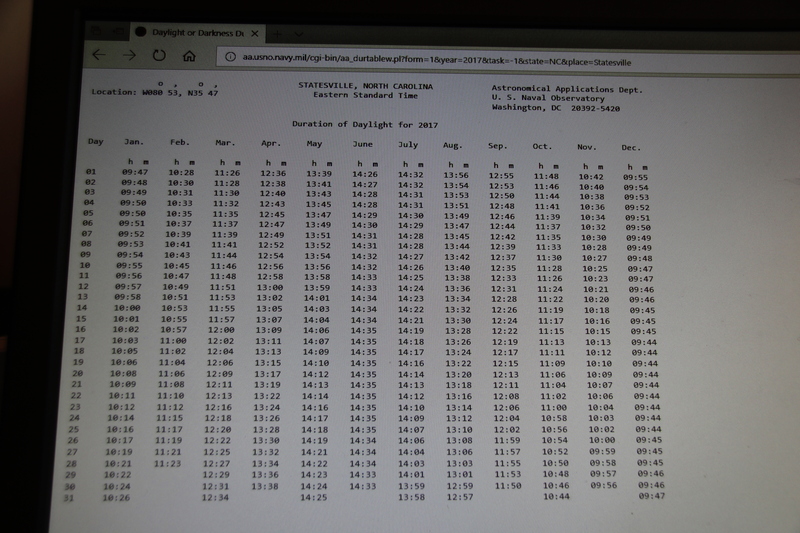 I consulted the US Navy’s charts on Duration of Daylight for my area. 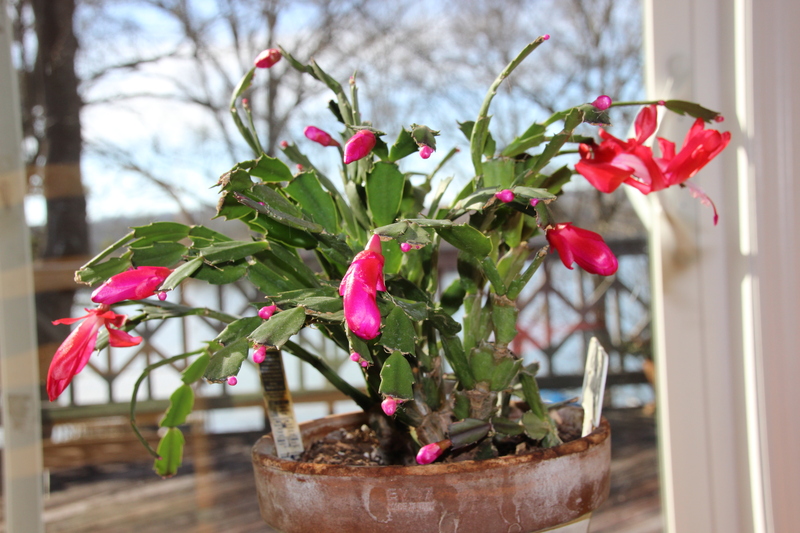 My cacti were blooming like crazy between November first and ninth of 2017. The daylength for those days was between 10 hours and 42 minutes to 10 hours and 28 minutes. Late January daylength has been just over 10 hours. Hmmm? I expected these to be about the same. Even my babies that just rooted and pieces in water are blooming. 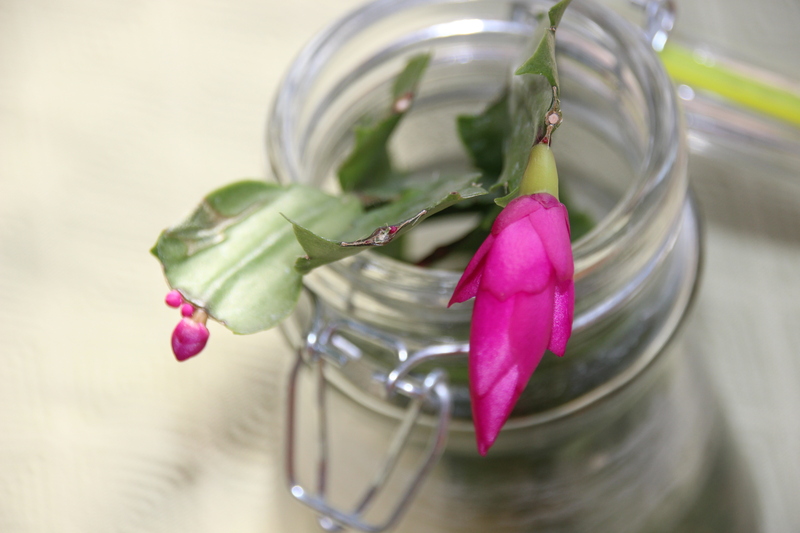 It could not be a change in temperature, because even the cacti in my cold workshop are budding and blooming. Just when you think you know a plant, it surprises you. I heard a symphony as I stepped from my car. So many sounds. Soft and soothing , yet exhilarating. The instruments had no strings. Water was playing. Water moving in various volumes at different tempos. Each instrument was unique in it’s shape and sound. How could anyone just choose one and break up this band. I never thought of fountain sounds before. There is usually only one playing a solo. Not at White House Garden Center in Cornelius, North Carolina. Here, there are dozens performing together. Each is as lovely to look at as to listen to. I went there on an errand and had an adventure. If you are searching for a fountain. You will probably find the fountain of your dreams there. Today, I visited the Wooden Stone in Davidson twice. Once before lunch to take pictures, and again after lunch. and to decide what pieces I had to have. Mr. Flower was with me, so this limited my purchase capabilities. It’s okay. I know how to get back to the lovely little town of Davidson, NC. Look for this lovely bench out front. I got two of the things photographed. I won’t tell which two because they are gifts and of course all my friends read my blog. I really wanted this cutie-pie for myself. My love of unusual plants came from three women, my Gran, my Mamaw and Miss Robbie. He was the missing man. We send him cards, now that his mother is gone. He usually sent a response. He was a loner. Very quiet, but always courteous and properly dressed. The cards came back. Where had he gone? I sent dear Mr. Flower to snoop around the homeplace. It was empty. A neighbor said he fell in the street, months ago. He left in an ambulance. He never returned. Where was he? I called the authorities. No one knew anything. I am not a relative, but since I was so upset, a nice person whispered some information. I called to make sure his only relative (age 94) knew where he was. She did. I heard his name on my answering machine yesterday. The city wants to tear down his abandoned house. It has been ransacked. These were someone’s belongings. Someone old. Someone alone. Someone ill.
Now the house itself is being threatened. I got no phone call today. I will call the nice lady tomorrow. I am not a relative. But I care. Please don’t mention this to my mama. She will have a fit. I am waiting for some good news. 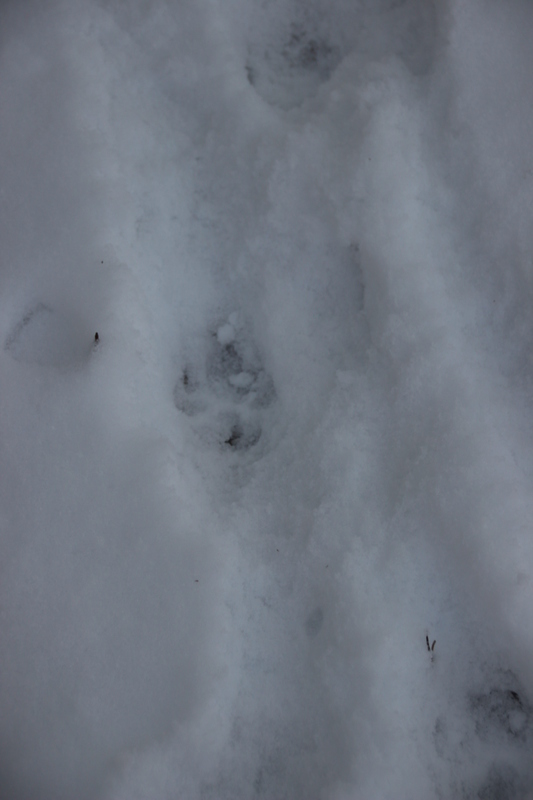 I wanted to post pictures of big bunny tracks for Ilze’s girls in Latvia. 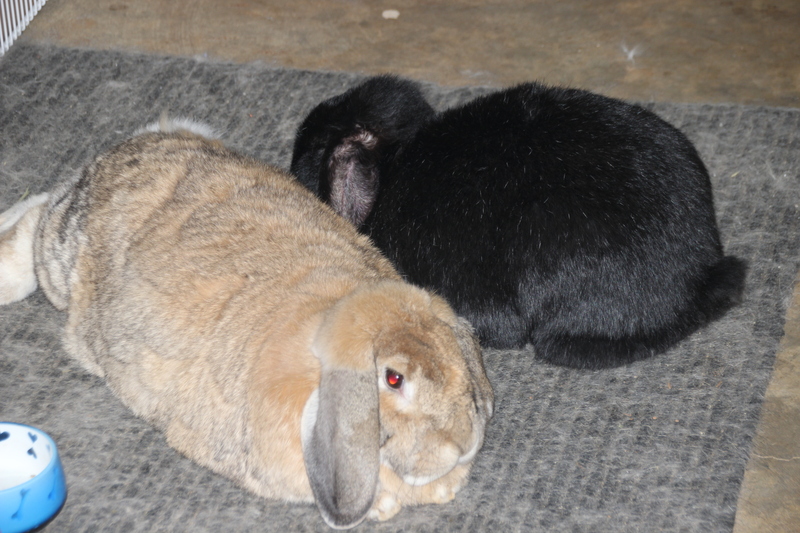 That would require my bunnies to walk in some snow. Is that too much to ask? Apparently, yes. These two photos are the best that I could do. They are spoiled you see. 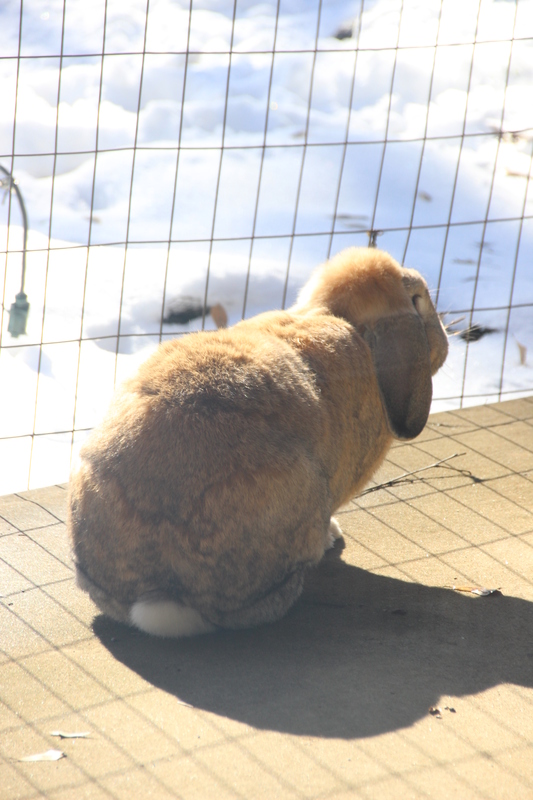 I spent two days shoveling snow off the deck above the bunny yard so they would not get dripped on. 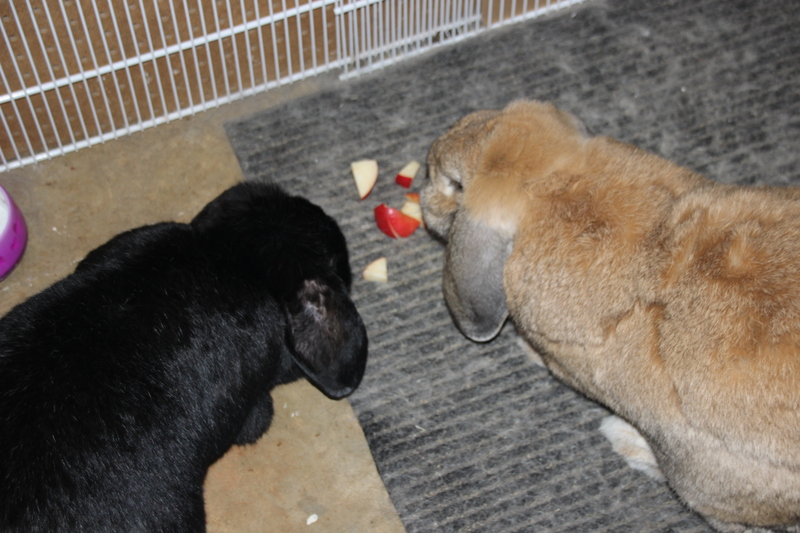 The bunnies spent the snow days snacking and napping. They do not like coldness and wetness. 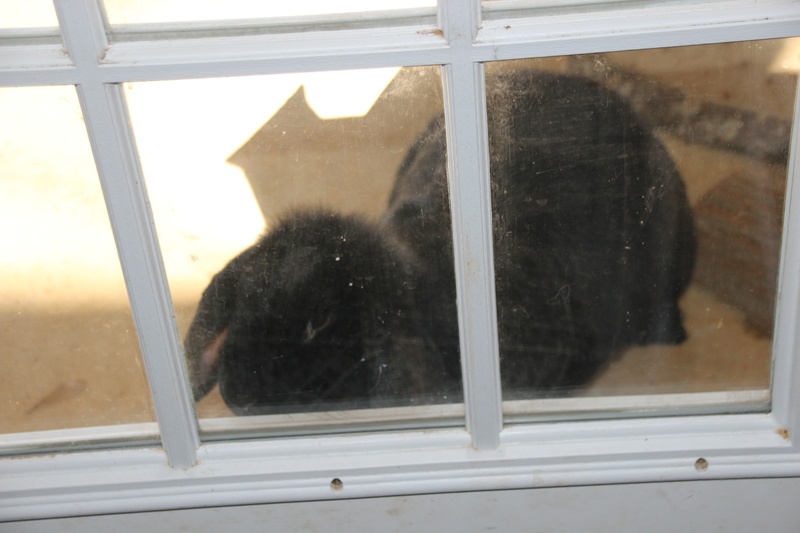 Charlotte peeking in the French doors of the bunny room. 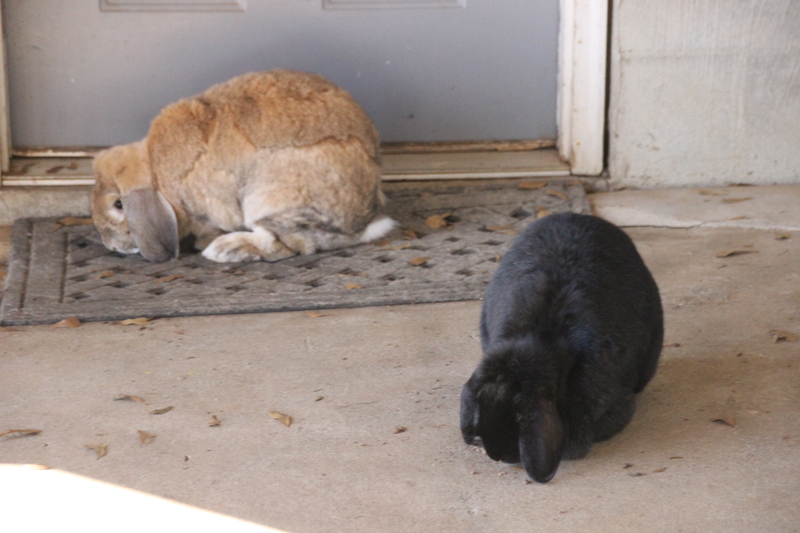 They are not wild bunnies you see. 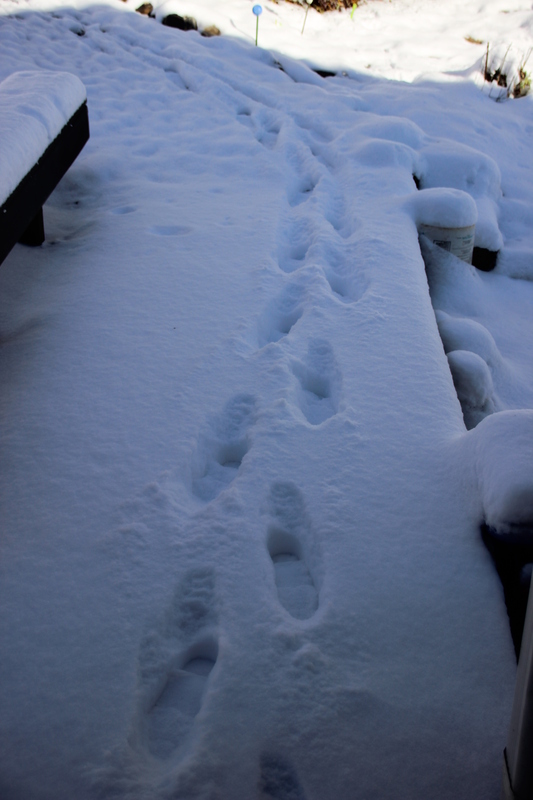 The snow said that we had many visitors while we slept last night. 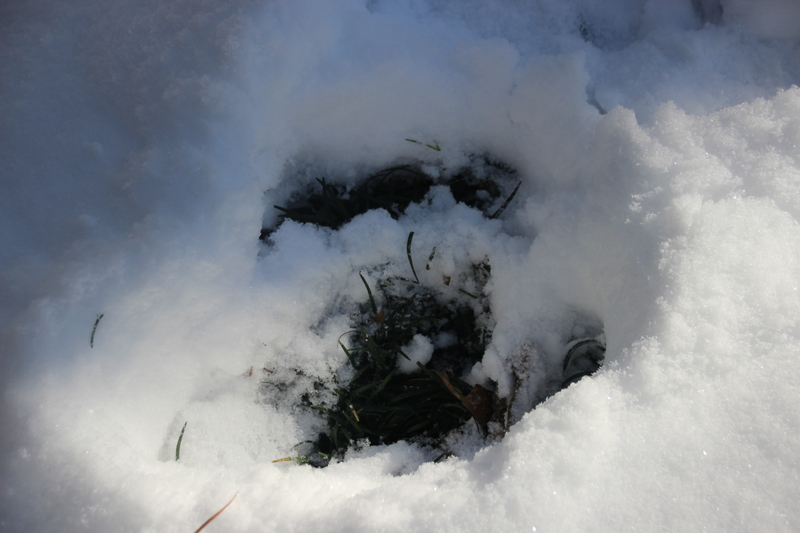 It said many deer came in the gardens to eat mondo grass and green shoots. 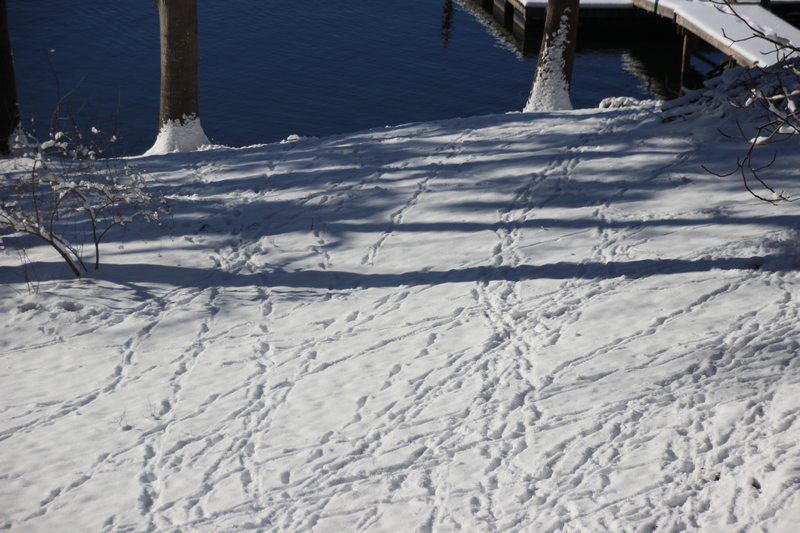 It said there were large deer running down the hill and a small deer walking up. 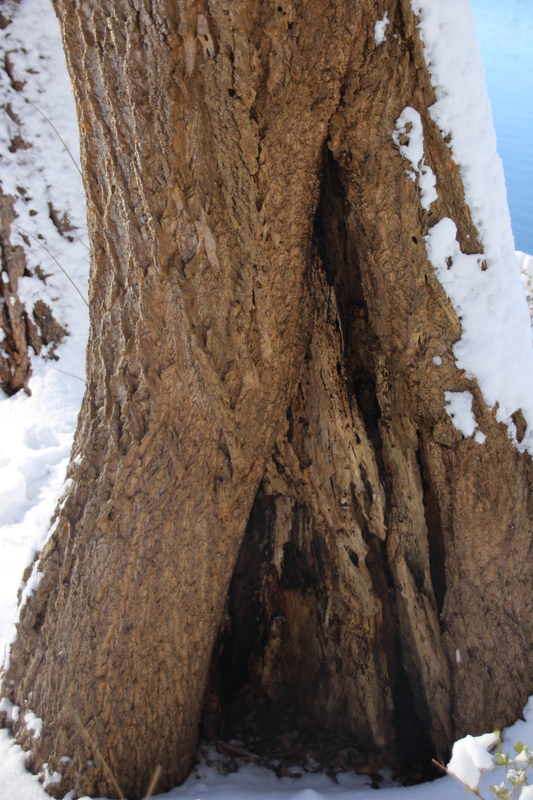 It said that someone small took cover in this hollow tree. 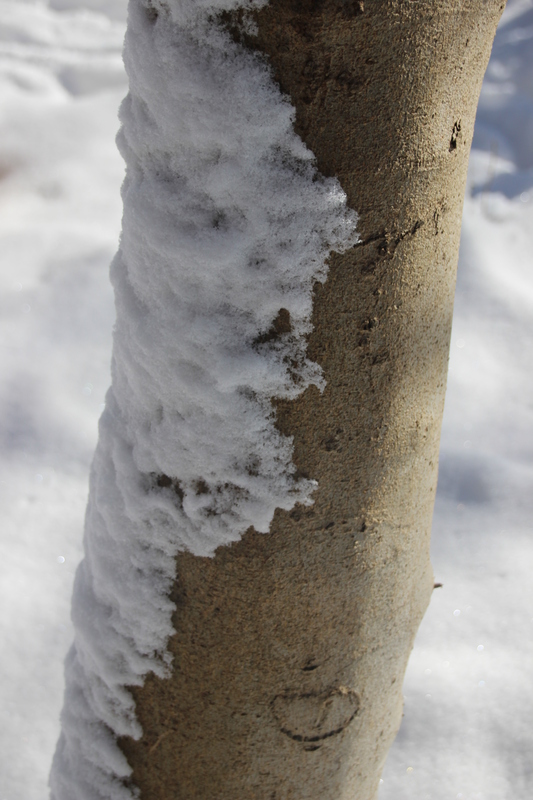 Something tiny hid in this overturned trough. Oh look. It is still here. Good morning Miss Wren. 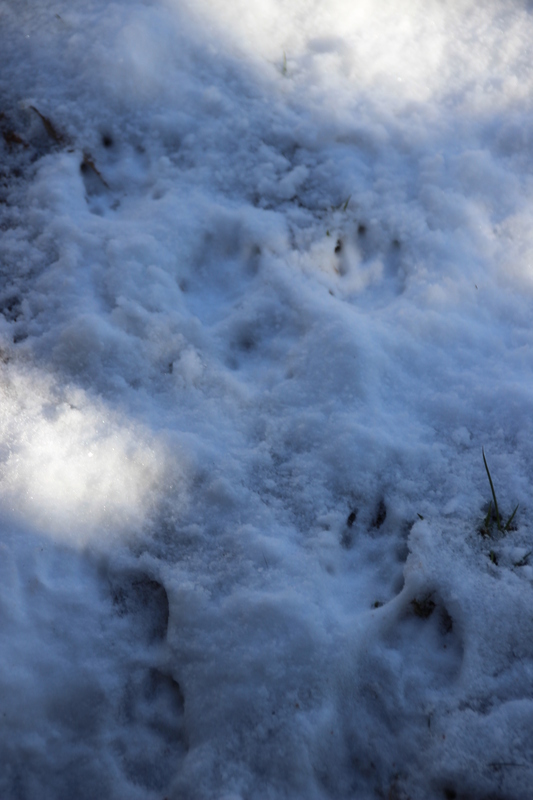 but most of the time the snow fell strait down softly. 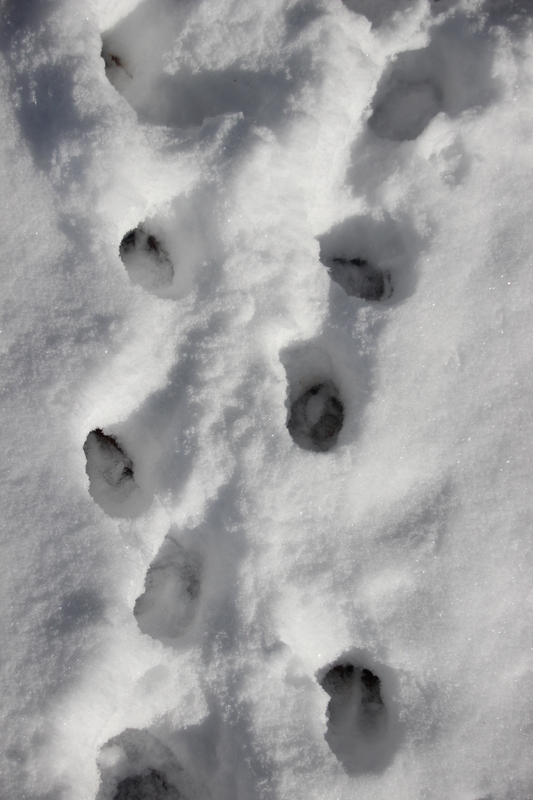 It said the neighbors’ beagle walked through our carport. 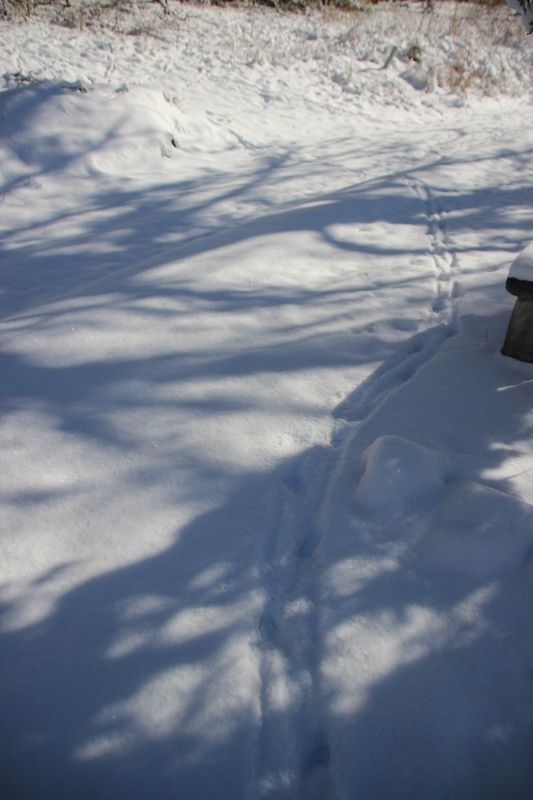 He chooses the path with the least snow resistance. 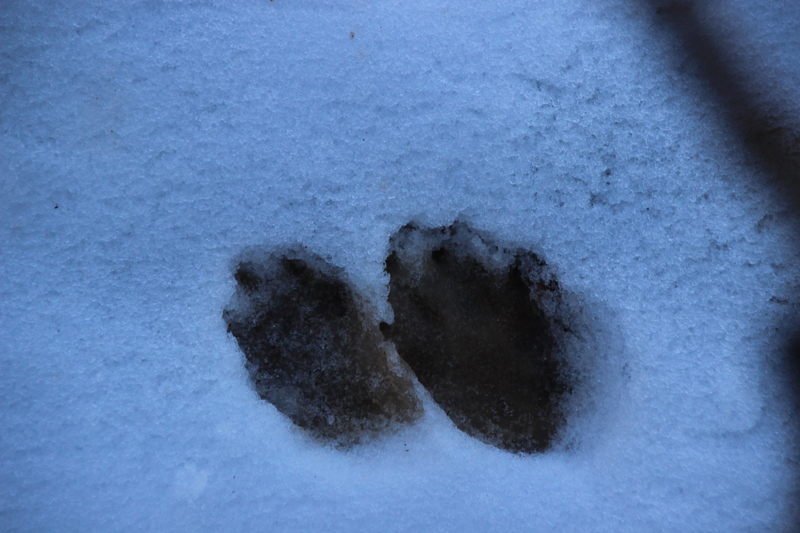 The snow also said that a coyote had been in the woods, after the snow stopped falling. It told me the wind was blowing by flying in my face. This made me laugh. This trail said that Flower is back home and that Mr. 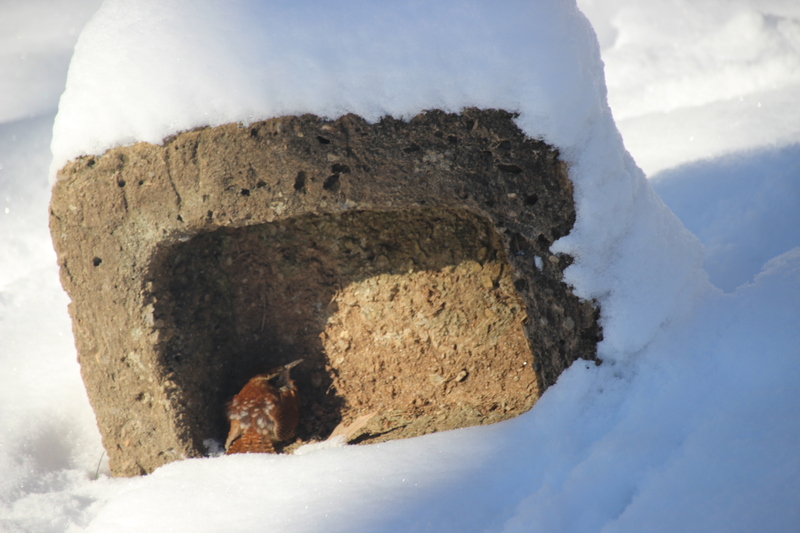 Flower has not used the new snow shovel that she bought for him. Ha. but not usually this close up. 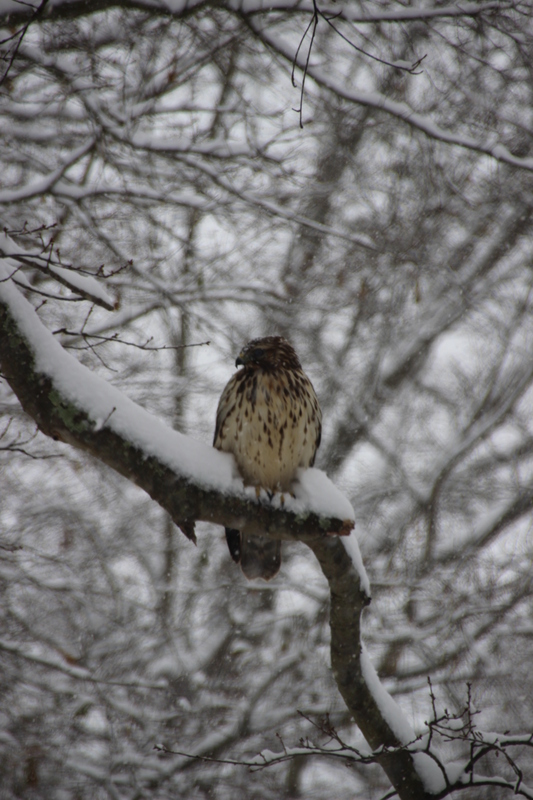 It looks like a broad-winged hawk. 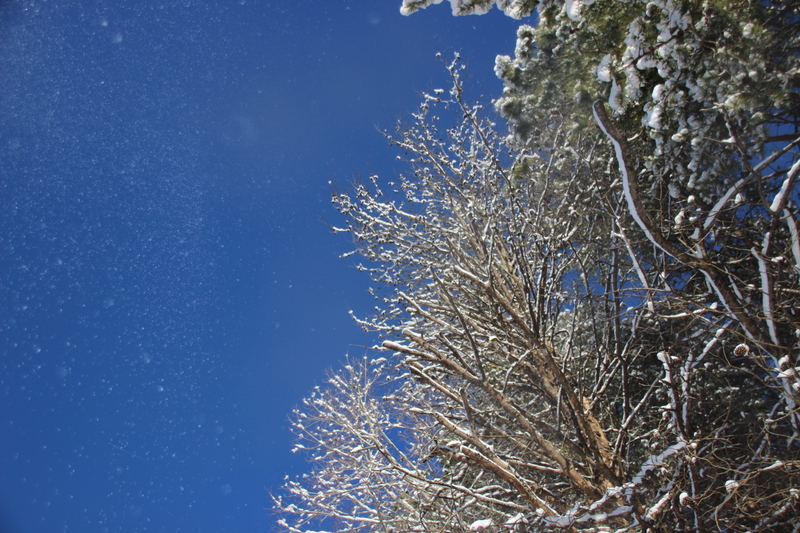 Luckily, I was wearing my camera when it decided to land in the tree nearest the house. 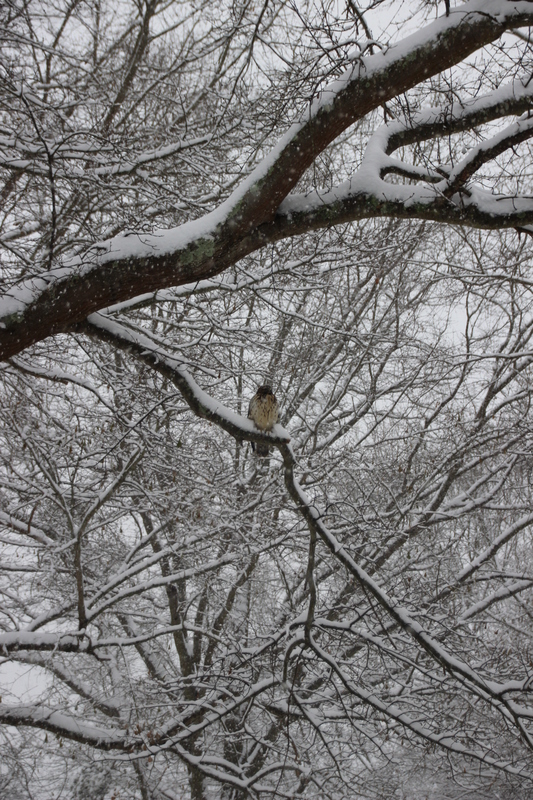 I watched it glide toward me and land on the branch covered in snow. It stayed for a few moments. 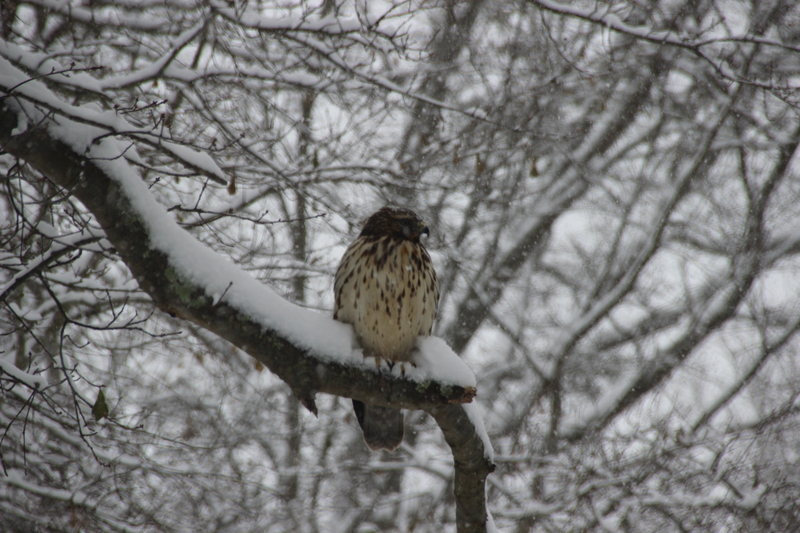 Notice the snow on its head. 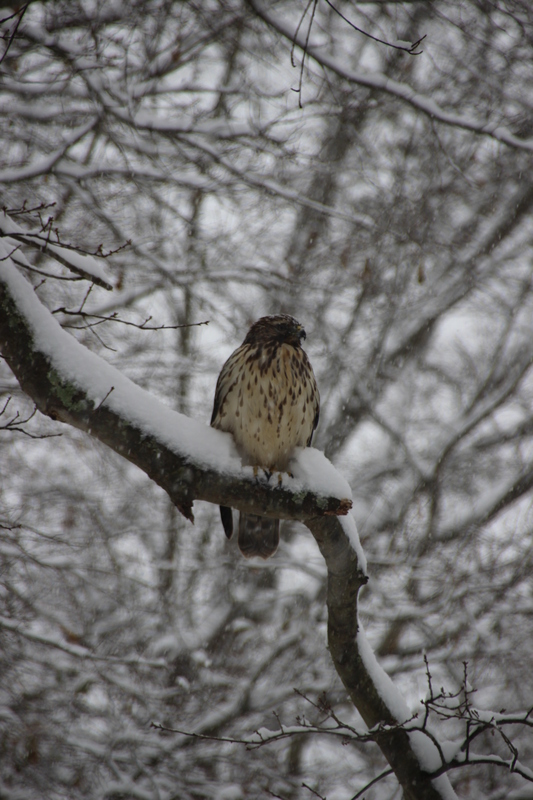 I was thrilled to finally get a good look at my flying friend. I fly in my dreams. My training is in science, but I believe in signs. I watch for them. I wait for them. I pray for them. I wondered how we would know which one was right for her. I liked all the places we went, but which one was the one? In the last building on the tour of a college was a huge lobby with two giant pots of blooming Bird of Paradise plants. That was it for me. Of course my sign would be a flower. That is a plant with a long history with my family. When I was seven, my family lived in Santa Monica for a time. 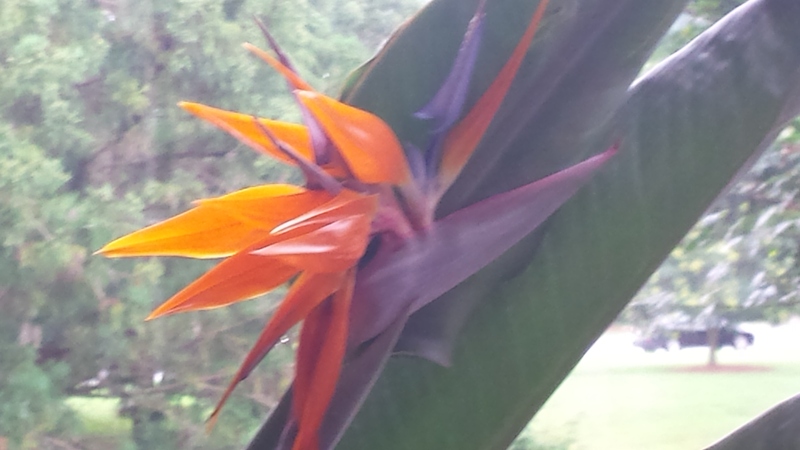 The courtyard of our apartment building had Birds of Paradise. I was fascinated by them. I am the little blonde in the socks. My dad’s mom had a huge pot of Birds of Paradise in her carport. I get my “flowerness” from both sides of my family tree. I have a Strelitzia reginae. 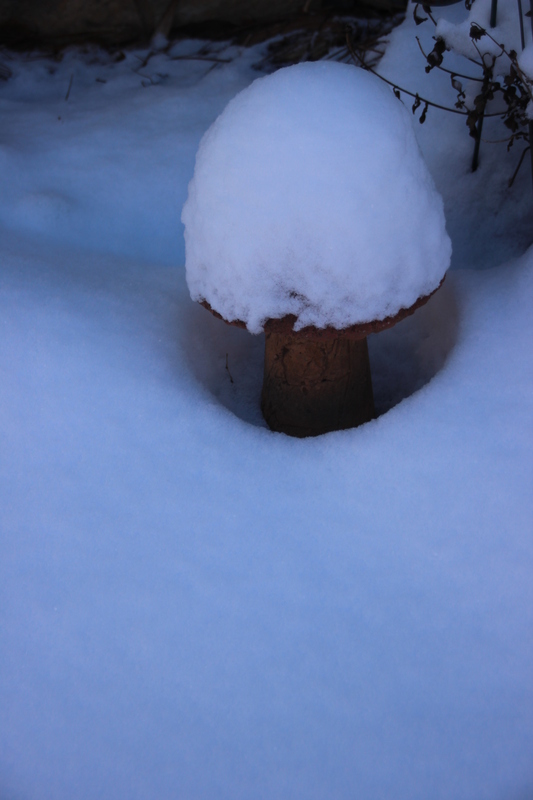 It has never bloomed. Maybe it will now. Will that be a sign, too? 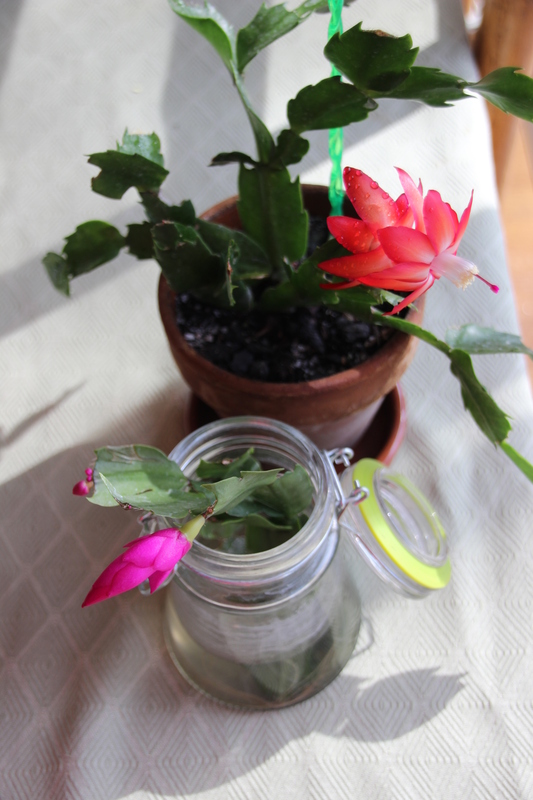 I am so happy to have anything blooming in January, even if it is inside. 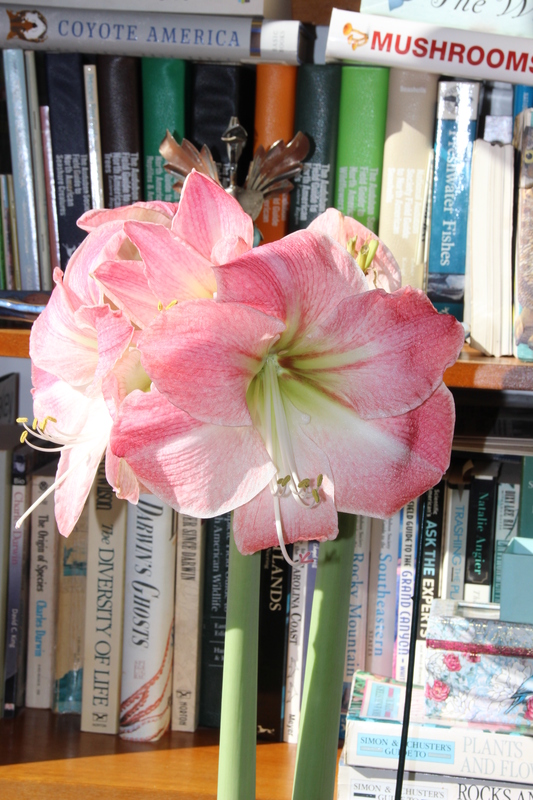 My lovely Apple Blossom Amaryllis/Hippeastrum is blooming again. The second stalk has produced six more blooms. The last bud has not opened yet and is sticking up to give its five sisters space to spread out. I love the delicate white petals and pinkish veins, but what I really admire is the shimmer. The petals look as though they have been dusted with a fine glitter. When the sun hits the blooms they truly glow. 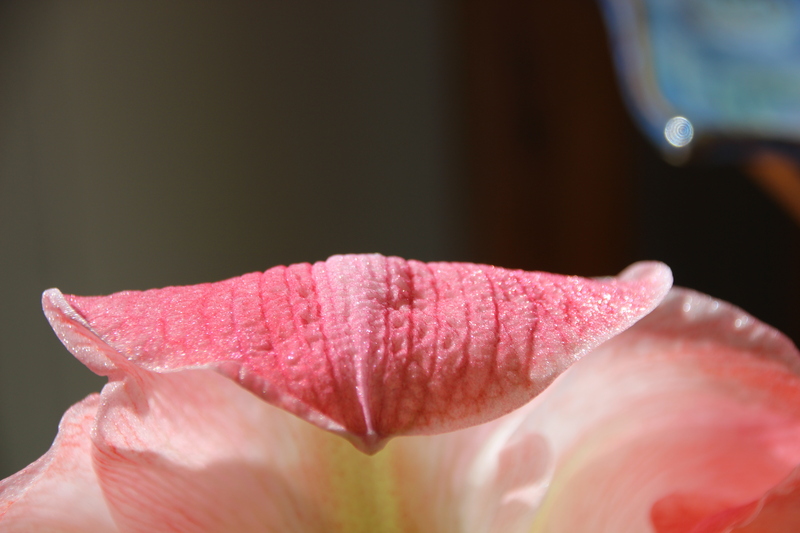 Apple Blossom Amaryllis is amazing!